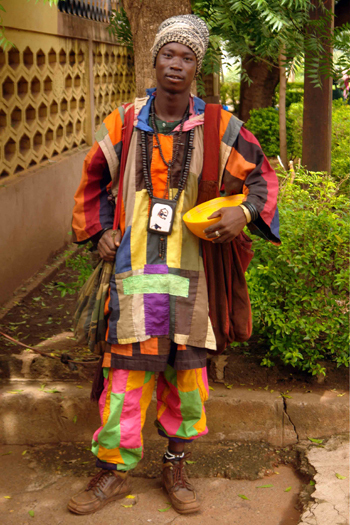 In Senegal beads are an important part of everyday life, just like all over Africa. By using stringed beads encircling the head, neck, arms, wrists, legs and ankles you tie up, protect and enclose unseen forces that make up inner, spiritual essence of persons and things. 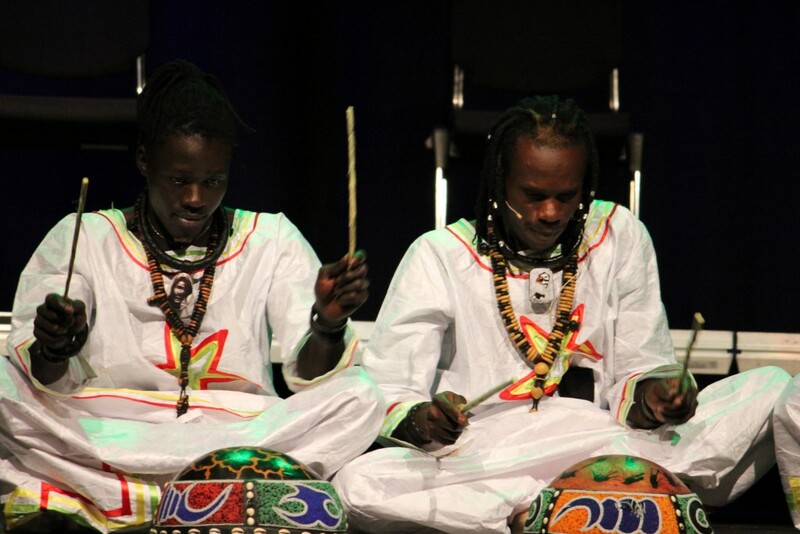 Spirituality and creative activity is also tied together as a dual foundation and most Africans remain deeply spiritual, something that influence their artistic expression. 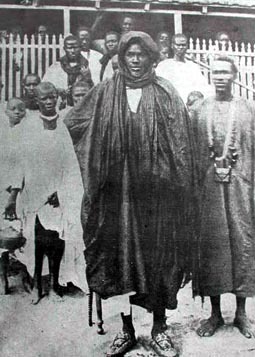 The Baye Fall in Senegal is a religious group following their spiritual leader Sheikh Ibrahima Fall (1855-1930). He was one of the major disciple of the Muslim Sufi leader Sheikh Aamadu Bamba Mbákke living from 1853-1927 who produced a prodigious quantity of poems and tracts on meditation, rituals, work and Quaranic study, as well as founding the large Mouride Brotherhood. He led a pacifist struggle against French colonialism while not waging war and his teaching emphasized the virtues of pacifism, hard work and good manners. As his fame and influence spread, the French colonial government worried about his growing power and any Islamic movement, and they decided to deport him to “a place where its fanatic preaching would not have any effect”. He was in exile in Gabon for 7 years, in Mauritania for 5 and then placed 15 years under house arrest in Senegal before the French colonial government decided he was not a threat to them. Sheikh Ibrahima Fall was always by his side, supporting him and lifting up his spirit to become the leader he became. Amadou Bamba decided that Fall should show his dedication to God purely through manual labor and that’s when he founded the subgroup of the Mouride brotherhood – the Baye Fall, many of whom substitute hard labor and dedication. By this brotherhood he helped Amafou Bamba to expand Mouridism. 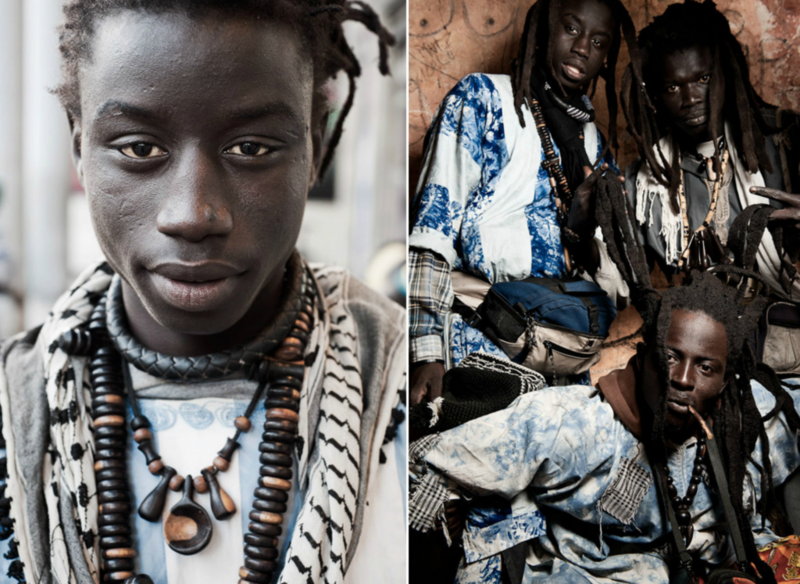 The members of the Baye Fall dress in colorful ragged clothes, wear their hair in dreadlocks which they decorate usually with homemade beads, wire or string and they can also be recognized by wearing large wood necklaces of Muslim prayer beads in different artistic shapes. They also use leather necklaces with a photo of Fall and other spiritual leaders attached as well. These praying beads of wood are a perfect example of spirituality and creativeness with their intricate shape and form, in particular the squared once that are cut in different angles and still fit perfect together on the string to form a circle around the neck.